This is the first page on the ninth strip of leather to be sewn into the scroll. The seam to the right has already been described on the previous page. There are a number of corrections on this page the most noticeable being the insertion of two lines of text in the space normally allotted for one line. It is not apparent how this was done but it seems possible that an editor erased what ever text had been in line 20 and inserted the whole of the last 4 words of chapter 34 and the first two verses of chapter 35. It would seem probable that the original scribe may have made the correction since it would be more difficult to eradicate completely what had been written in that line originally if some time for the ink to set had passed. This correction contained an omitted word so that the correction is corrected. This is described under the Variations : noted in line 18. This page is also wider than most. The text occupies a space almost 20 per cent wider than the next page. Thus the facsimile of the page above is proportionate to the previous and following pages. There are so many peculiarities which differ from the preceding pages and many more unusual kinds of mistakes and spelling variations that a new scribe may be the only answer for the differences found here. For instance the 3ms pronoun is consistently spelled adding a final he. As, he waw aleph he instead of he waw aleph which is the spelling in most of the preceding pages. Reserve your judgment until after you look at the differences in the page here. There is a peculiar editorial mark which looks like a derby hat (the first of 6 times to be found in the scroll) in the right margin below line 28. This is a mark that shows a change in the sectional content of Isaiah, since it is coincident with the end of chapter 35. Line 28 ends the last paragraph of that chapter, the line not being filled out with text. Chapter 36 begins immediately after this mark which looks somewhat like a wide brimmed hat. This marks the end of the prophetic description of the Assyrian siege of Jerusalem and begins the historical description of the event. Although this is the first time it has appeared in the text it appears again on page 32: line 28 and page 35 line 23 and page 38: line 6 and on page 43: line 21, and on page 49 line 5. This particular mark marks the beginning of important sections where there is sharp break with the content of what has just ended. Thus on page 28 the mark is sited at the beginning of the historical account of Sennacherib's invasion. The mark on page 32 marks what is probably the most important division in the book at chapter 40. Less obvious is the mark showing a division of thought on page 45 at chapter 42:13; The mark on page 38 marks the section devoted to Cyrus beginning with chapter 45 and again less obvious is the division at chapter 52:7 noted on page 43, but the mark on page 60 marks an important division in thought content from descriptions of the Messiah's coming with warnings not to be excluded from Zion to excluding the warnings and giving a picture of spiritual events associated with the Messiah and Zion and the conquests wrought by Messiah and Zion among the Gentiles. Another peculiar editorial mark is at the end of line 19 which looks like a large O. This is the end of the line just before the erasure and insertion of line 20. There is also a word inserted in the text in the margin just above this O mark. This mark is also found at the top of page 17 but there is no apparent reason for it being there. Following line 25 there is a word written vertically in the left margin. It is a misspelling of the word for "unclean" "tame:'h" spelled with final "he" in Q but with "aleph in M. Aleph and "he" are frequently interchanged by the Q scribes. There is a horizontal mark in the right margin in line 20. These frequently seen marks usually set off the beginning or end of a section deemed to be important by an editor. Ordinarily they come in pairs but there is no corresponding disconnected mark to begin or end a section associated with this mark. Perhaps it is associated with the mark of line 28. See introduction for further discussion of other editorial marks. Line 12: A dot is placed over and under a kaf (prep as) in the next to last word in line 12. The word: " 'ephes" (nothing) is in M without kaf. The dots mean the entry is incorrect but no attempt to erase it is made. This is a common editorial mechanism and has been seen several times in preceding pages. Line 18: 10th word: There is a dot under and over the mem in the word "la-hemah" and a nun is written in place to correct an error making the masc. suf to be fem. Line 20: There is a dot under the next to last word "majesty." Line 26: There are two dots over the last letter of the first word and in the space between the second to indicate an error but it is not corrected. The error is that the first word should have a conj. waw and the 2nd should not so what is the case needs to be reversed. The need for correction is noted by the dots but is not made..
Line 28: There are two dots placed over 2 letters (beth and he) after the 6th word in line 28. These dots indicate a scribal error and a mistake in the text. The letters should not be there and are not found in the received text, they are a mistake. See the introductory page for further discussion of the use of dots in corrections. This conjunction: It has been noticed previously that the scribe or scribes have been consistent for a time and then alternate between spelling "kiy with and with out a final aleph. 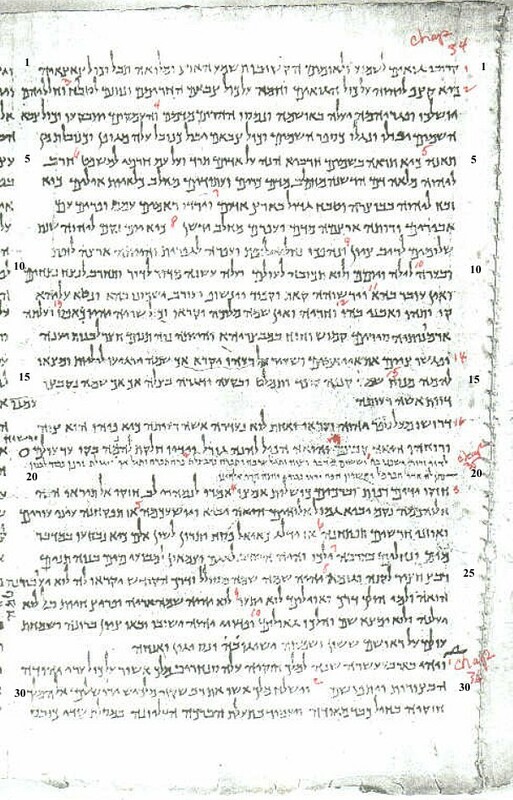 The last entries of "kiy on the last page (27) on lines 24 and 26 both spelled without aleph and the last before that are 3 occurrences each on pages 24 and 25 all spelled without aleph. On this page the scribe begins again the switch back to spelling kiy with aleph. Four times: Line 5: 2nd word; line 6: last word; line 17: 12th word; line 23: 11th word. As just said the last 8 usage's of this conjunction on the preceding page and pages 24 and 25 spell the word consistently without the aleph. This may indicate a change in scribe especially in light of the large number of possible Aramaicisms on this page noted below under variations from the Masoretic text.. The end of a paragraph is marked in the usual way of not filling out the line with text and is found in line 16 ending 34:15; line 20 ending 35:2; and line 28 ending chapter 35. Spatiums are found in line 8 beginning verse 34:8; and line 30: beginning verse 36:2. There are only 3 occurrences of an editor writing corrections of individual letters between the lines. Over the first word in line 13; over the 3rd from last word in line 18 and over the last word in line 25. We will comment on the individual words they are over in the section on variations in the text. Line 1: 2nd word: Q is consistent in spelling "goy'iym" with aleph not in M.
13th word Q - a waw edited above the line. Line 3: Q = "he" added to 3mpl suf making an extra open syllable in the 2nd and 4th words. 6th word: Q = article "he" not in M.
Line 3: 8th and 9th words: Q = a different reading for the first two words in vs 34:4. Q = "ve-ha-'ameqiym yithbaqu," (the valleys shall be broken up) and M = one word "ve-namaphu" (be dissolved.) This continues in . Line 4: 2nd word: Q continues the different reading with "yipholu" (they shall fall) an extra word not here in M but which is used in Q and M in the next phrase. This has to be called a confused verse in Q. Line 5: 3rd word: Q = "tera'ach" a superfluous word not found in M.
Line 6: 5th word: Q = a mistake in the spelling or forming of letters in the word "me-cheleb" (from the fatness of). 10th word Q = an extra aleph in the middle of a word not called for "kili'yoth" and M = "kilyoth." Line 8: 3rd word: Q = "he" added to 3mpl suf. Aramaic accent? Line 12: next to last word: See note above under Dots to Indicate an Erroneous Entry. Line 13: 1st word: Q = an editorial waw inserted above the word. This would change the pronunciation which in M is " 'armenotheyha" and in Q would look like " 'armonotheyha." But Q uses waw to indicate any vowel sound and here it is likely inserted to indicate the schva sound instead of o or u. See more on waw stands for any vowel. 5th word: Q = Aramaicism adding aleph to 3fs suf. The aleph also indicates an open syllable. Line 14: 4th word: Q = spelling of islands as " 'iyiy'amiym" and M = " 'iyyiym." 10th word: Q = "yirgiy'u" 5th stem 3mpl. (they shall rest) and M = "hirgiy'ah" 5th stem 3fs (she shall rest). 11th word "liyliyoth" nfpl (owls) It is the subject of the preceding mas. pl. verb. M = lilith nfs. Last word: Q = "ve-mats'u" pf 3mpl (and they shall find) and M = "ve-mats'ah" pf 3fs (and she shall find). Line 15: 1st word Q = "lahemah" prep lamed + 3mpl suf with added final "he" (to them) and M = "lah" prep lamed + 3fs suf "he." (to her or it). 5th word: Q= "qipod a misspelling of the word owl. M = "qipoz." Words 10 to 12: Q = a redundant word and a superfluous "he" Q = " 'ak 'ak shamah" and M = " 'ak sham." Line 17 and the first 3 words of line 18 is verse 34:16. This is the next to last verse of chapter 34. If the reading in the Masoretic or received text is faithful reconstruction of Isaiah's actual words then this is one of his most confused constructions and does not conform to his ordinary literary excellence which at almost all times is the work of a genius. The M text appears to me to be grammar too poor to be Isaiah's. The Q text does not contain at least three major words in this sentence found in M. And the construction of one phrase is altered putting a negative in a different location. One of the major verbs in M is also missing in Q. In M "phaqadu" makes little sense since it usually means to visit (as with a stroke or punishment) but here is translated "want" which is taken to be "lack" (NIV) rather than "desire." The M text for this verse actually defies a translation that would not be extremely clumsy with out altering the word order greatly.. Complicating this in M the word " 'ishah" (woman) is translated "none" in the KJV and "not one" in NIV and thus it is treated like a negative pronoun. Perhaps the simpler reading in Q is to be preferred in this verse. After the word "one" (" 'achat") M has "me:henah" (from them: fpl. prn). This is not in Q. In M after the word "re'uthah" the words " l'o phaquadu" negative + verb pf 3pl is not found in Q. There are two negatives in M only one in Q. For this phrase Q = "ve-achat lo' ne'adarah 'ishah re'uthah ki' " and not one doctrine will lack her mate because..." The next phrase differs slightly and the Q seems to me to be preferred. The phrase translated "for my mouth it has commanded and his spirit it has gathered them" (KJV) has the confusion of possessive pronoun making the writer and God alternate as subject.. This is corrected in NIV. However Q makes this plain with "kiy' phiyhu hu' tsivah ve-ruch-ho hu'ah qibatsan." The 3ms sufs on mouth and spirit are made emphatic in Q by the addition of the 3ms pronouns and the translation therefore is "because his own mouth has commanded and his own spirit has gathered them." M does not have a suf on "mouth" although NIV translates it as though it has 3ms. It is more likely that the suf found in Q is the correct reading. Thus the verse in Q reads "Seek you out of the book of YHWH and read: for not one doctrine will lack her mate because his own mouth has commanded and his own spirit has gathered them." Line 19 and 20: In Q the reduced sized text agrees with the M text in all except there is an article on the word Lebanon in M but not in Q. See last word in line 19. Also in Q there is a spatium with 2 unexplained dots between the words "'aph" and "giylath." Next to last word on line 20 has a dot under "majesty." Line 22: 1st and 8th words: Q has "kemah" 2mpl suf and M = "kem." 6th word: Q spells 3ms pronoun with final "he" not in M.
Line 23: 7th word: Q omits conj waw found in M.
Line 24: 4th word: Q has the word "ye:lku" (they shall walk or go) which is not in the received text. The verb in Q may refer to the streams of water in vs 6 and therefore close the verse. It can not fit as the first word of vs 7. Line 25: 1st word: Q = "rebets" (resting place) and M = "ribatsah" is rebets + suf 3fs. (her resting place). 7th word: a redundant word; Q = "shamah shamah" and M = "sham" (there). last word: Q = a waw edited for pronunciation. last word in margin Q writes a missing word "tame:'" (unclean) in the margin and spells it with final he instead of aleph. Line 26 1st two words and dots: See above under Dots.... Also see in 1st word the "he" on 3ms pr. n. not in M .10th word: Q = "shamah:" and M = "sham." In the next line Q spells "sham" without the "he." Last word: Q = a double negative "bal l'o" the 2nd (l'o) is not in M.
Line 28: 7th word: Q = "ve-nas" cj + 1st stem pf 3ms ( and it shall flee) and M = "ve-nasu" 3mpl. (and they shall flee). Line 29 is the first verse of chapter 39: Q = Hezekiah in the 6th word. Hezekiah's name appears 30 times in the Q text with 4 different spellings. found once in 1:1 and pronounced "yehizkiah." is found 7 times in 36:1,2,4,7,15,16,22 and is pron. "hizkiah." See one example in first word on last line in the page above. is found 6 times in 36:18; 37:1,10,14,15 and also in a scribal insertion at 36:15 between lines 20 and 21 and is pronounced "hizkiah"
is found 14 times in 37:5,9,21; 38:1,2,3,5,9; 39:1,2,3,4,5,8. and is pronounced "yehizkiah." Q = "hizqiyah hamelek" and M = "hamelek hizqiyahu". Rather than the order being important here there is a more important good illustration of the Q scribe's use of waw to indicate a vowel sound. Waw is inserted here in Q in Hezekiah's name between the 1st and 2nd letters. This may not seem important here but it points up the mistake made by most editors in ascribing a different reading in Isaiah 49:12 to the word "Siniym" which most have taken to be China (see Gesinius) in the M text but recent Q editors (see Kittel) ascribe Asswan to the Q text by giving the inserted waw a consonantal value and arriving at "Seveniym." That the Q scribe ment waw as a semi-vowel is clearly seen here and should be read so there as well. See notes on Isa 49:12 on page 41 comments on line 12 for greater detail. If we took the track the recent editors did with ( which they chose to call seveniym) then we might conclude that there is another man by the name of "hevezekiah" or "yehevezekiah" in Isaiah 36 to 39. Of course this is no more the case than the spurious "seveniym" of the recent Q editors. Line 30: 9th word: Q does not have the locative "he" sufformed on Jerusalem found in M that means "to Jerusalem."